There are many parallels between life in the District and New Orleans. Black people have a rich history in both city reflected in their music. As both cities undergo a transformation, the way of life as many Black residents have known it is in threat of extinction. For New Orleans, tourists are taking over and staking their claim in areas that mean more as vacation spots rather than something of cultural value. In the District, transplants enjoy the “yuppie” lifestyle without consequence while locals are slowly getting silenced. Natalie Hopkinson, formerly of the Washington Post, drew those parallels on her visit to the Big Easy. Those at Cafe Istanbul on the evening of June 22nd heard the sounds of Chuck Brown, the Godfather of Go-Go while they ate authentic New Orleans cuisine. This genre is indigenous to the District and according to Hopkinson, it is an endangered species. In her new book, “Go- Go Live: The Musical Life and Death of the Chocolate City,” she tells of go-go’s rich history and the tough bind that the genre finds itself in the face of the District’s demographic changes. The District, affectionately known as “The Chocolate City” has been majority African – American since 1957. Go-go was and is still a way of life for many native Washingtonians who enjoy the spiritual feeling one can only get from attending a live show. Go-go has formed communities. It sparked children’s interest in music. It’s encouraged entrepreneurship. It’s something Washingtonians take great pride in. Even with its potency, it has struggled to leave the city but that is not by accident. It is authentically D.C. and a critical part of a culture that natives and visitors alike have come to love and appreciate for so long. The District’s economic boom ushered in an era where cranes rose into the sky and the most desolate of neighborhoods received a makeover. Young, white professionals from outside of the city quickly moved in to experience what D.C. had to offer in these new times. Unfortunately, as many already know, that would not be go-go music. Go-go clubs are closing all over D.C. and moved out into the suburbs of Prince George’s County and Montgomery County along with many Washingtonians who could not afford the rising rent. Even in parts of Maryland, it’s still in danger of extinction. Lawmakers see it as a cause of violence rather than an expression of the frustration felt because of violent conditions its artists and listeners experience firsthand. With Chuck Brown dead, the debate about go-go’s present and future is even more important. The debate unearths questions about race relations and politics in the District. One other element that is hard to ignore is go-go’s transformation. Many who grew up listening to Chuck Brown, EU, Trouble Funk and Backyard do not consider the Bouncebeat, a newer, louder, and more uptempo version of go-go, a legitimate part of the genre. Now that Chuck is gone, where do the young bands go from here and how do they keep go-go alive in the face of its present challenges from the outside and inside? They may not have much to worry about. Chuck Brown gave them his blessing many times in the course of his life, even performing with one of them, TOB, less than a year ago. 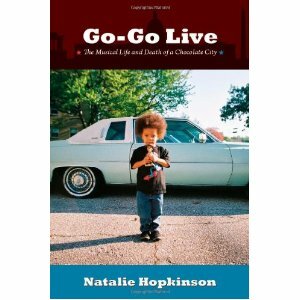 Whether or not you are aware of this transformation unfolding in the District, it is imperative you read “Go-Go Live: The Musical Life and Death of the Chocolate City.” It helps you put what’s unfolding before you in context, which these days is very important. It hits shelves and online stores on June 25,2012. Get your copy immediately!